The United States has a proud history of taking outstanding generals on the battlefield and promoting them to executive office. From our very beginning, General George Washington became President Washington. General Sam Houston became the first President of Texas. Now Texas is presented with the opportunity to promote a different kind of battlefield commander as Texas Attorney General Greg Abbott announced his candidacy to become the next Governor of Texas. 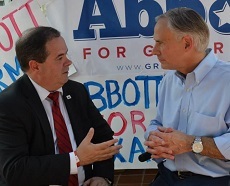 Immediately after his announcement speech before a little over 1,000 cheering supporters yesterday in San Antonio, I had an great opportunity to talk one-on-one with General Abbott. We touched lightly on a variety of topics facing Texas and Texans and at the end Abbott promised to conduct follow-up interviews to drill down into the specifics of individual issues. Abbott is fond of saying he has the best job in Texas. "I go to work, I sue the federal government and then I go home," he jokingly says. So I had to ask why he would leave such a great job to pursue the office of Governor. "Well as the attorney general," Abbott explained, "I've literally been the general on the battlefield in fighting against an overreaching federal government, fighting to protect our liberty. I'm now seeking to move from being the general on the battlefield to being the commander-in-chief, leading that effort throughout the entire state, working with next attorney general but also with the state agencies. It could be Health and Human Services pushing back against the medicaid expansion trying to be enforced in Washington, DC. It could be working with Texas Commissioner on Environmental Quality to push back against the overreaching EPA that's trying to crush jobs. It could be continuing to lead our efforts to prevent laws coming to Texas that deny our Second Amendment rights like what we're seeing in some other states, but I will continue that fight against threats to our liberty from the commander-in-chief position as governor for the state of Texas." During his speech, Abbott talked about one of those battles where he fought not only the World Court, but also the President of the United States where the Court and the President attempted to stop the execution of an illegal immigrant who had raped and murdered two young girls in Houston, not very far from my home. While that battle was waging at the U.S. Supreme Court, I was on the grounds of the Huntsville State Prison where the execution of Jose Medellin was being delayed pending a court decision. The families of 16-year-old Elizabeth Peña and 14-year-old Jennifer Ertman were very grateful that General Abbot stood tall for them and for Texas. Texas has a track record of being one of the best states in which to do business. No state income tax, lawsuit reform and proper levels of government regulation of business have created a climate that is positive to business growth. Along with that comes an increased demand for roadways, water and other infrastructure needs. I asked the General how he would attack these issues from the perspective of a limited-government, fiscal conservative governor. "What we have to do is set priorities," Abbott firmly stated." We have to put strict limits on what our spending will be, so we don’t bust our budget. We can’t go down the pathway of California; or Illinois; or Washington, D.C. Texas will only remain an economic leader if we have strict controls in our budget. Then, when you do that, you set priorities. And as you noted, because of our growing population needs, everyone sees our declining water table, everyone sees our roads more congested, everyone sees that we need to improve schools. What you do is you say, 'These are my priorities.' We fund these priorities first, and then if we have to make cutbacks in other places, that’s what we have to do. So we’re able to achieve these challenges and address these challenges, not by spending more, but by right-sizing government and making cuts worth it." 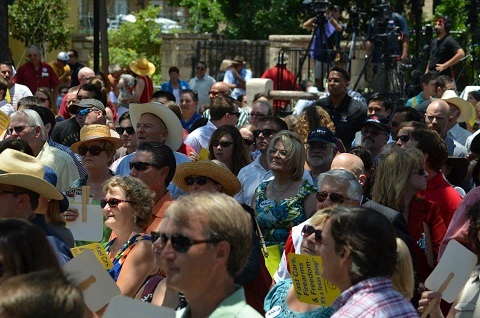 Texans for Lawsuit Reform along with Citizens Against Lawsuit Abuse did tremendous work in reducing litigation in Texas. It has been so successful that Congressman Lamar Smith (R-TX) is now presenting federal legislation to enact national lawsuit reform. I asked Abbott how this has affected the Texas business climate and what his role has been and will be in relation to frivolous lawsuits and other tort reform issues. "Well, if you go back fifteen or twenty years," he recalled. "Texas was known as the litigation capital of the world. It was crushing business here, companies were leaving the state of Texas and taking the jobs with them. Because of reforms brought in part by Citizens Against Lawsuit Abuse, by Texans for Lawsuit Reform, the Texas economy has changed and now businesses are relocating to Texas because we have a more pro-business litigation economy. I think it’s right, for the United States economy, for Lamar Smith to be taking up that reform to the United States of America. Texas has shown the way to create jobs. Lamar Smith is showing the rest of the country what the Texas model looks like, and what it can do for the entire country." Last week, in Austin, the Texas Legislature passed a sweeping pro-life bill aimed at stopping abortions after 20 weeks and improving the quality of healthcare for women conducted in abortion clinics across the state. This bill is obviously headed to the courts and ultimately to the Supreme Court. I asked the General about his role in defending life and Texas sovereignty in these areas. "The new bill that just passed that protects more life in the state of Texas, is now moving from the state house to the courthouse," Abbott stated. "I will be the leader in defending that bill, just like I have been the leader in defending so many pieces of legislation that have been passed, that protected life. I was the national leader for the states, protecting the partial-birth abortion ban. The national leader of the states, in protecting pro-life legislation parental notification. The state leader, of course, in protecting so many of the pro-life laws that have passed at the state legislature for the past couple years, I will be there once again, in the courthouse, defending this legislation." Finally, we touched on Texas' natural energy resources. The Eagle Ford Shale project along with other huge Texas oil resources have brought our state bountiful jobs and revenues. Unfortunately this has come with a cost to our state in construction costs from the destruction of our roadways from the perils of over-weight trucks. Texas also faces much resistance from the liberal-controlled federal government who neither wants Texas nor oil companies to succeed. I asked Abbott how he would leverage our resources for the benefit of Texans and how he would protect Texas against an overreaching federal government bent on stopping our nation from being energy independent. "You know, it’s funny," he said, "because Texas is, and always has been, the energy leader in this nation. I saw a story this last week where, if Texas were its own independent nation, we’d be like the eighth or ninth largest producer of oil in the entire world. We may produce more oil than many OPEC countries. And, we must remain energy independent. It’s better for our economy, and it’s better for our security." 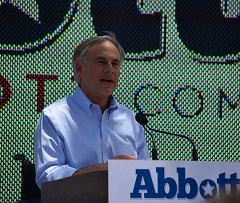 We will not allow the federal government to trample on our independence," Abbot continued. "Whether it be energy independence, or any other kind of independence. And therefore we will continue our fight against the overreaching policies of Obama’s EPA. There have been rumors that Obama may try to crack down on fracking in some way. We’re not going to let that happen. I’ve had three victories in court against Obama’s overreaching EPA, in just the last eighteen months or so. And we will be back in court again, if we’re forced to, if the Obama administration tries to crush jobs in Texas." After thanking General Abbott for his time on this very special day for him and for Texas, I got his commitment to come back to TexasGOPVote throughout the election season to go deeper into these issues and others like human trafficking, border security and illegal immigration. 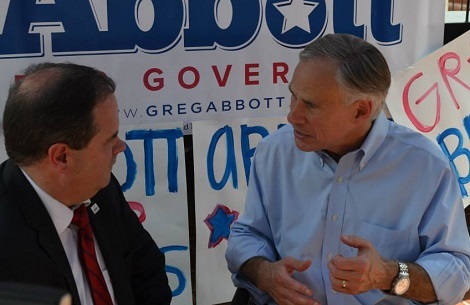 Abbott concluded the interview talking directly to the people of Texas when he said, "I look forward to visiting with you, and with all voters across the state of Texas. I will be crossing the state of Texas over the coming weeks and months, for the next sixteen months. I will be taking my case directly to the voters to explain to you why I represent the liberty that we all need in this state, to keep us fighting against Washington, D.C., keep us fighting for the values that made the United States of America, and the state of Texas, the best place to live, and raise family. I am on your side. You can count on me." Click here for additional reading on lawsuit abuse.